Cardassian uses ten of the letters of their alphabet for numeral glyphs, however they are usually flipped in relation to the rest of a text. Where it is necessary to distinguish numbers from letters, three dots in a triangular formation are used as a numeral determinative to mark the following glyphs as numbers. 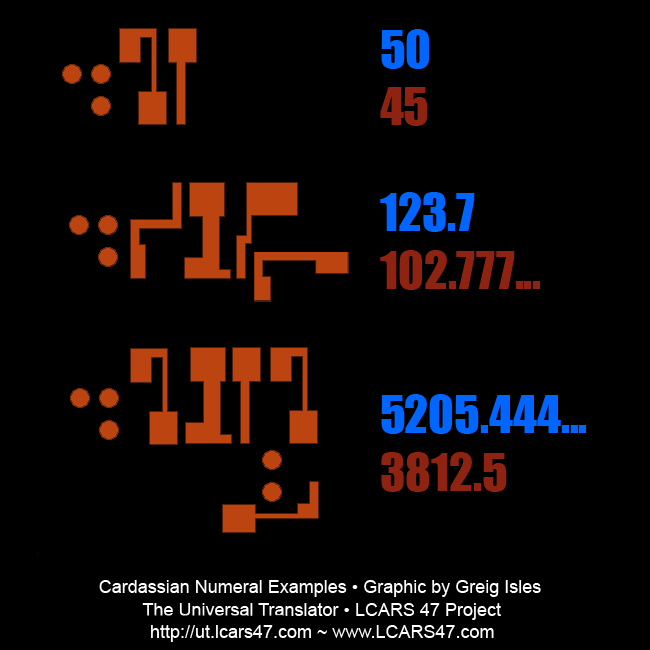 In terms how the numerals write numbers, the Cardassians use a place value system similar to our own numerals; higher valued numbers come first with lower valued ones coming last. The only real difference is that the Cardassians use a base nine or nonary numeral system as standard: place values thus represent multiples of nine and not ten, as in a decimal system, so: 10 = 9, 20 = 18, 30 = 27 etc. 100 = 81, 1,000 = 729 and so forth. 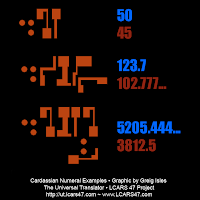 Cardassian numerals do also contain a glyph for 9, which can be used in decimal notation. However, this tends only to be used in mathematics and science; the Cardassians preferring base nine for everyday use. Numbers are typically read and written in the same direction as the rest of a line of text; the standard punctuations marks of small circle, large circle and paragraph circle (refer to part 2) being used to indicate direction of reading. Fractions, be they nonary or decimal, are written by using the same numeral glyphs as whole numbers, written underneath an whole number, at a 90º clockwise angle. Two dots may be written before a sequence of fractional numbers to indicate they are recurring. Where fractions occur alone without a leading whole number, they are written below a zero. Well that about concludes all there is to say about Cardassian and their numerals. 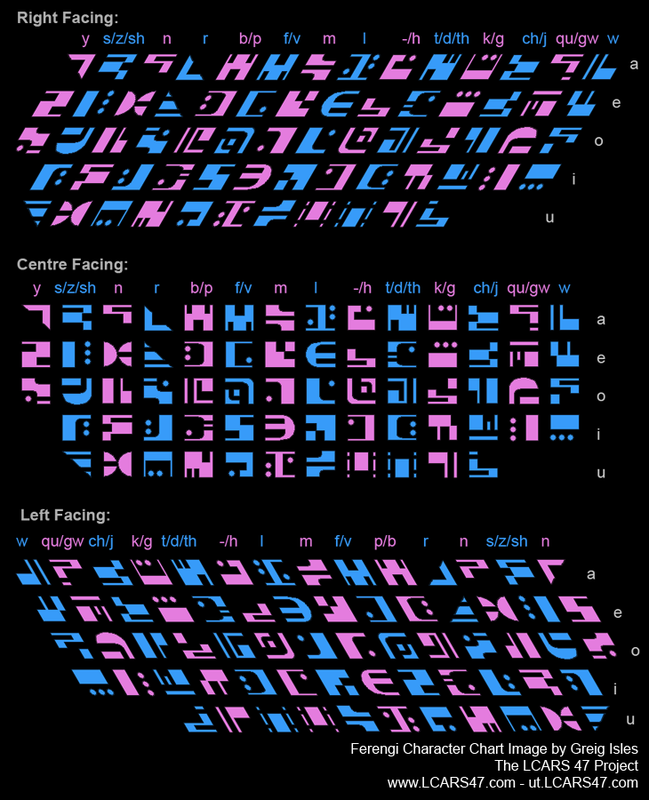 The design for the Ferengi script is a syllabary. 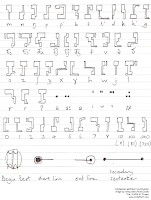 I decided to base the script on a syllabary for one reason: Keiko O'Brien's school room in Star Trek: Deep Space Nine shows a large number of Ferengi symbols laid out in a chart. 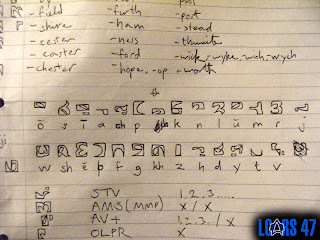 This same chart displays the English alphabet as well as the Cardassian and Bajoran Scripts. 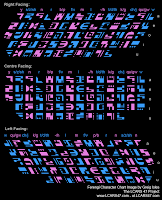 The Ferengi block of text is five characters high, fourteen characters across. This resembles the layout of a Japanese kana table; a kind of syllabary used in writing Japanese. As well as Japanese, inspiration for how the script works comes from Linear A and Linear B writing systems of ancient Crete, that were syllabaries, used primarily for recording business transactions, inventories and contracts etc. I found this to be appropriate for the Ferengi. The Mayan script also served as a major inspiration in terms of function; an hieroglyphic script with a syllabic base, it is used to write a more complex language than the syllables the script represents. This is why I based the spelling system on a combination of Mayan and Linear B (Linear A is undeciphered). A CVC syllable is written CV-CV, where the two vowels match: yo-po [yop] 'I, me, my'. Some consonants, in particular [s], [h], [l], [r], [m], and [n], may be left unwritten at the end of a syllable or before a consonant; this is called 'under-spelling', and is uncommon, except in very common words: lo [los] 'you, your (pl)'. A syllable with a consonant cluster is written the same as a CVC syllable, so: so-ko(-o) [sko] 'to do', ti-ri(-si)-ka [triska] 'metal', o-we-ke(-se) [hoeks] 'Hoex (proper noun)'. A syllable with a long vowel (CVVC) is written CV-Ce, unless the long vowel is [ee], in which case it is written CeCi: du-pe [duup] 'to inherit, receive', de(-i)-mo-no [deemon] 'DaiMon (Captain)'. Long vowels in words of more than one syllable can be under-spelled: ge-re-ko [greeko] 'Greko (proper noun)'. A syllable with an r-coloured vowel (CVrC) is written with a final a if the vowel is [e, o, u], or with a final u if the vowel is [a] or [i]: vo-pa [vorp] 'Vorp (proper noun)'. Where the r-coloured vowel ended a syllable, ra or ru were used: po-fa-ru [pofar] 'small ship, runabout'. A preconsonantal nasal [n/mC] may either be written in full, indicated by modification of the following syllabic glyph, or be left unwritten: fe-re(-ne)-ki [ferengi] 'Ferengi'. Word final vowels may be emphasized with V symbols or the y and w symbol groups respectively: bi-ri-ye [briiy] 'to tell, instruct', pi-ta-a [birta] 'Birta (proper noun)'. C = consonant, V = vowel. In part 2, I will be discussing paragraph layouts, writing direction, and just what those hexagons actually mean. 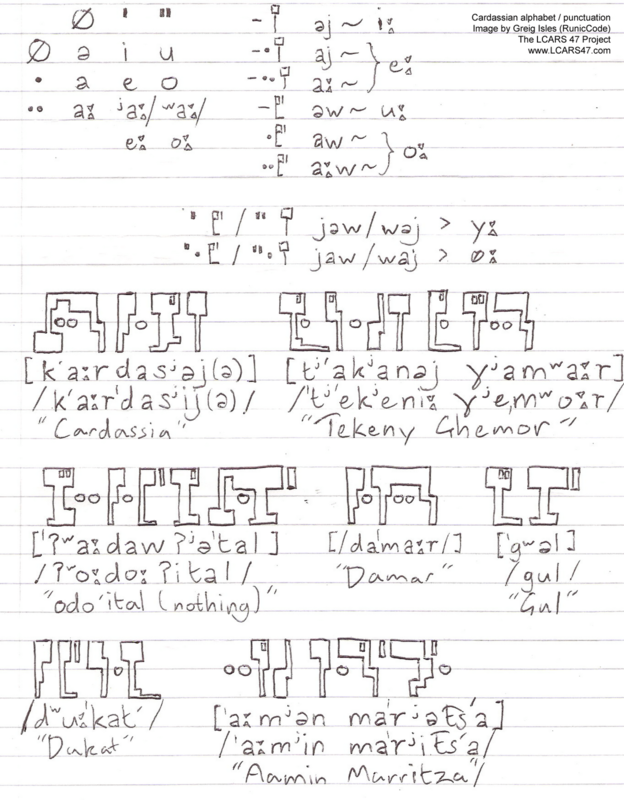 In my last post, I told you about the basic workings of the Cardassian alphabet, this time around, I'm going to tell you how it all strings together (I promise there will be no big, complex words in this one). 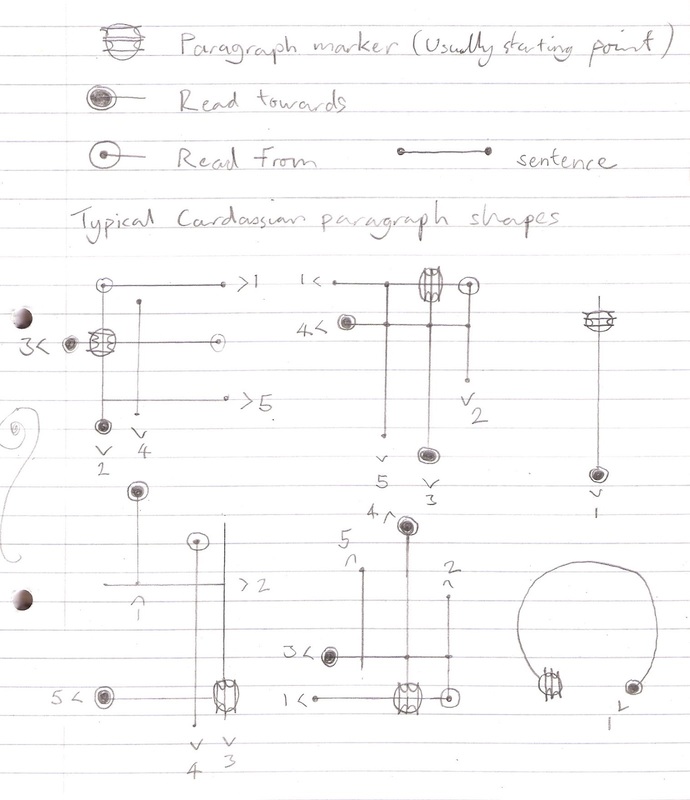 Cardassian text incorporates 3 primary punctuation marks and one secondary mark: for want of better names, I will call them small circle, large circle, paragraph circle and large dot. The small circle and large circle resemble a small and large circle respectively, outlined. There use is to generally give the reader a general sense of direction in reading a paragraph: text is read away from a small circle and toward a large circle. 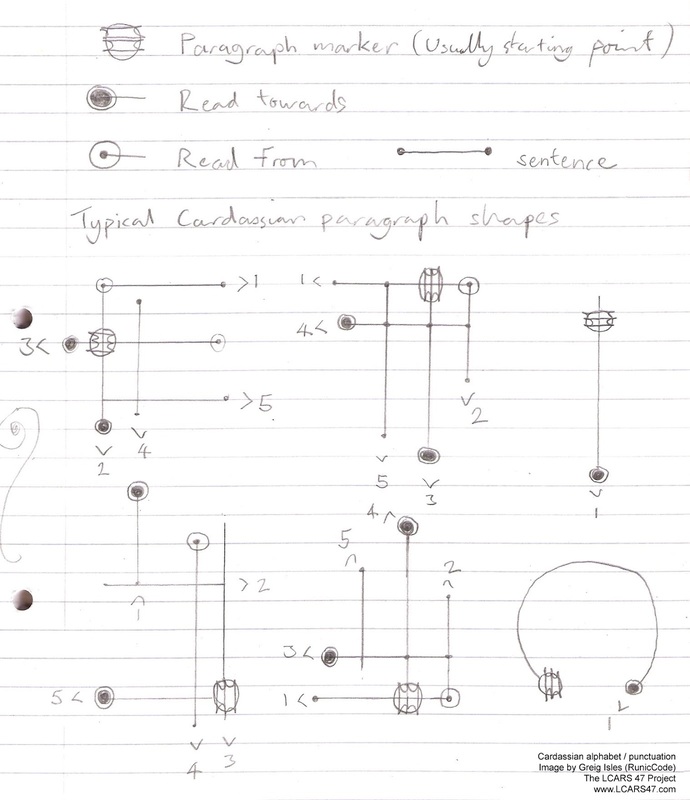 The paragraph circle does what it's name says, marks paragraphs. usually, although by no means exclusively, it marks the beginning of a text. The large dot is used to cap the end of lines. Cardassian text is usually overlaid over a central line, however it can be written without this central line where necessary. When this is the case in a paragraph, it's usually because the written information is of secondary importance, or is an annotation to the main line of text. The overall writing direction for Cardassian is preferably from top to bottom, however, bottom to top is not uncommon. Finally, letters can be written in a reverse direction; flipped horizontally in relation to the letters in a text, this serves a similar function to italics in English. In the final part (which I promise will be shorter), I'll discuss numbers. Originally posted by Greig Isles on 07 September 2012. A lot of Klingons the world over have pointed out to us that the Klingon text in HaSta 'elqarIS is not the Klingon Language Institute's pIqaD, or alphabet, but is instead the "Skybox pIqaD", an alphabet used on Fleer/Skybox Star Trek trading cards in the early 1990s. 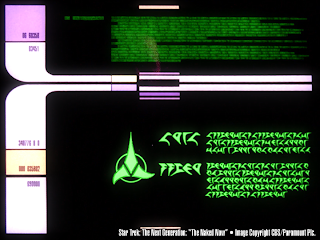 The Skybox pIqaD uses the "Okuda Ten", a subset of ten Klingon Glyphs which form the bulk of all Klingon text seen on screen. 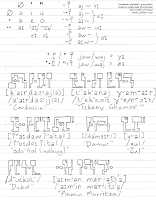 It was pointed out that this usage was wrong, and that the KLI pIqaD should be used instead; in part because the Klingon speaking community has adopted KLI pIqaD as it's "Klingon writing system" of choice, because it is easy to read, fairly simple to write, and has a one to one sound to grapheme correspondence. 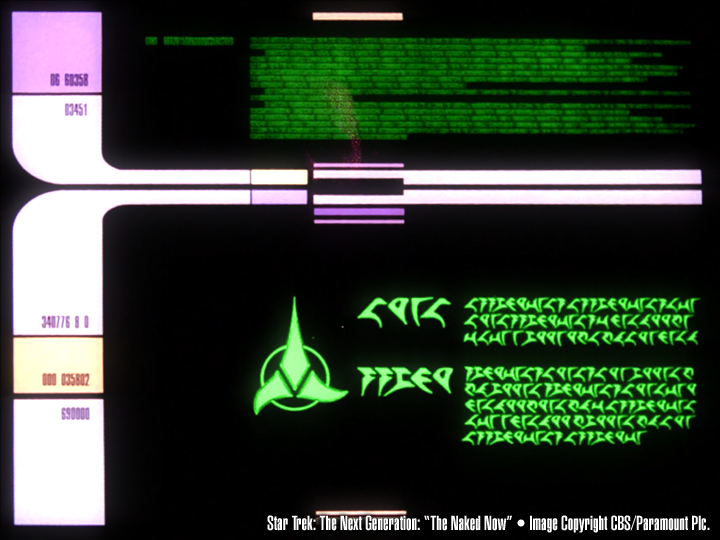 The "Okuda ten" are canon, in as far as the vast majority of all Klingon text seen on screen actually only contains those ten letters. Conversely, on an on screen basis, the KLI pIqaD is categorically not canon, containing letters that seem made up. Although on screen Klingon text was just random letters, a way was found to make those random letters say something (at least on those trading cards), which became the basis for the written Klingon script today. The upcoming release of the book "Federation, the First 150 Years", uses the Skypox pIqaD in it's artwork to write a Klingon document, showing that we're not the only one's using this alphabet. Early Arabic and the Younger Futhark Viking runic alphabet were fairly ambiguous in writing their respective languages (insomuch as having far more sounds than actual letters in thier alphabet, like Klingon). I hope that this clears up our stance on the Klingon script, and why we are going with the more canon option. We would ask our users to remember, this is just a novelty, a bit of fun. Originally posted by Greig Isles on 08 August 2012. Eleanor asked me to map out a Romulan alphabet for an upcoming database module in Prolixus. So I started jotting down some notes based on screenshots from various Star trek productions. 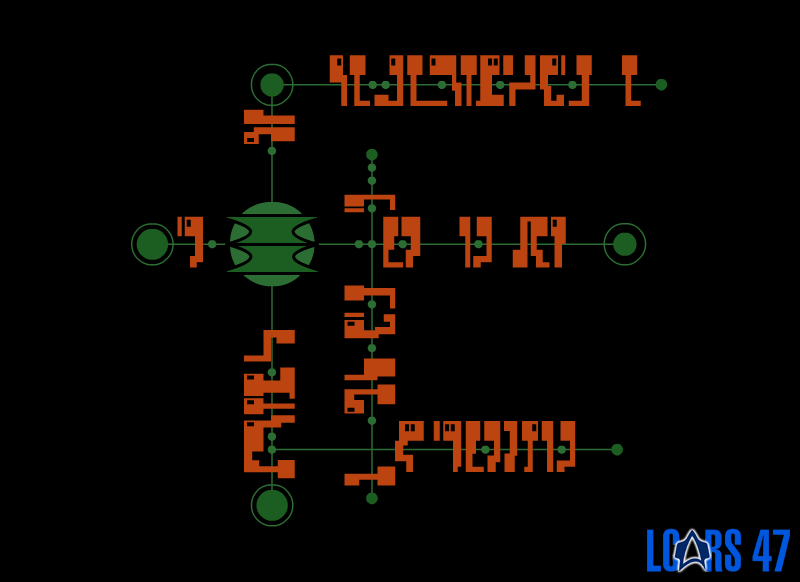 After a few revisions I came up with a final design for a Romulan alphabet that followed the designs and layout of the script as seen in the show. 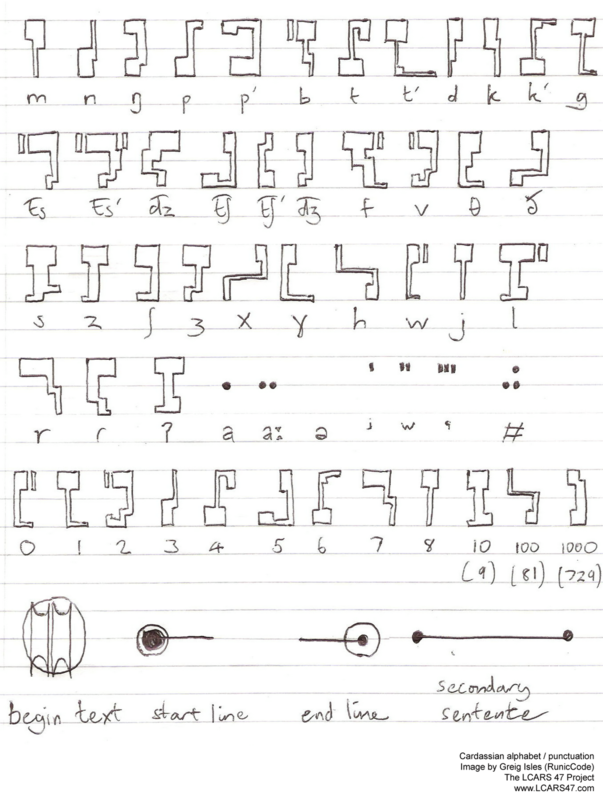 The idea for how the script works was inspired by the Arabic and Hebrew alphabets; in particular the square shapes of Hebrew reminded me of Romulan glyphs. It was for this reason, as well a need to keep texts from growing too cumbersome, that I decided to incorporate the rule about dropping vowels within words. The script is written both horizontally and vertically within the show, so it seemed only right that this was included in the reference image. I chose to have the script go from right-to-left, in horizontal mode again, as a direct inspiration from Arabic and Hebrew, and also, because it seemed more alien. The vertical script running in columns, from top-to-bottom, left-to-right, is a direct consequence of rotating the script in horizontal mode, 90° counter-clockwise. Something similar is observed in the real world with the Mongolian alpahabet. The alphabet as it appears here is based on canon (no official translation of the glyphs appears in canon, but we think this works). Originally posted by Greig Isles on 17 July 2012. Hello, and welcome to the Universal Translator, a blog dedicated to the alien written languages of Star Trek. Here, I will discuss the inner workings of the alien scripts from Star Trek and how they can be used to write down information. This blog is a spin-off from the LCARS 47 project; I originally posted there but we all agreed my subject matter warranted its own space. This project is a way of explaining how alien written languages can be 'written' in as much as the alien written languages as seen in Star Trek are simply set decoration and don't translate into anything really. 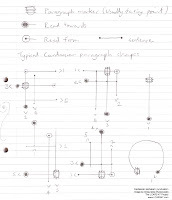 Although non-canon, I will nevertheless endeavour to create alien scripts and writing structures that closely follow on screen text samples, while at the same time having an alien flavour to them. I hope you all enjoy our work, and I look forward to any feedback!